Month #1 of my shopping sabbatical is coming to a close, so what better and more ironic way to celebrate than with a list of the top 5 temptations that might lead me astray? 1. 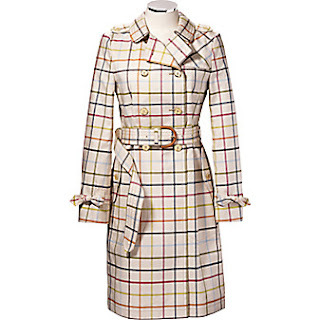 Coach Tattersall trench coat, $798. The tattersall print is as much a recognizable trademark for Coach as the check print is for Burberry. I myself love the muted pink, orange, green, and blue in the tattersall against the crisp white background. The print as a whole is perkier than Burberry's. 2. 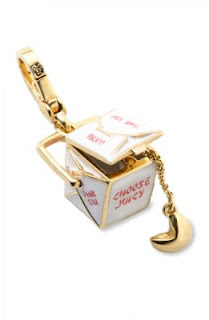 Juicy Couture Chinese takeout charm, $48. So unbelievably cute! There's a gold fortune cookie inside the container! And look at that classically kitschy lettering on the container!! This would make such a cute addition to a basic handbag or a standout zipper pull on a beloved hoodie. 3. Urban Outfitters men's skinny walking short, $48. Last year, I eyed the long bermuda shorts all over stores with a skeptical eye. This year, I can't imagine not having my black twill Old Navy bermuda shorts in my summer wardrobe. I like this pair from Urban Outfitters because the fabrication, gray colouring, and menswear details give them a dressier touch. They'd look top-notch with wedges or espadrilles. 4. Anthropologie 'Underpinning' shades, $28.67. Anthropologie is notorious for pricey goods in my books, but their sunglasses this season are surprisingly affordable. 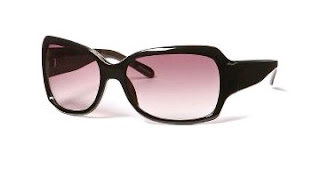 Perfect for lolling on the beach or bodysurfing in the waves when you don't want to risk your designer shades. 5. 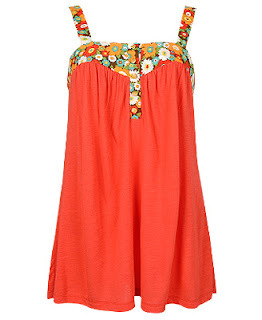 Country flower tunic, $17.80. Cute tanks and tees are the perfect cheap thrill.